Does walking into your kitchen make you want to walk right back out? A kitchen that’s outdated or just plain drab can be depressing, but so can the realization of how much it will cost to renovate it. The good news is that you don't need to do a complete overhaul to get happy in your space again. Little changes can actually make a big impact, and many of them can be done inexpensively, easily, and without having to hire someone. A new backsplash can make your whole kitchen look fresh, and it’s generally an inexpensive update (unless you pick some kind of super-fancy, limited edition, hand-forged, imported tiles). Anyone who’s even painted their own kitchen cabinets will tell you it’s not an easy or pleasant job. But, in the end, it’s worth it to have a kitchen that looks brand new - not to mention the savings. Opt for a professional paint job, and you can be looking at spending several thousand dollars! If you’re going for it, make sure you do your research, and your prep work. You don’t want to spend all that time only to end up with a splotchy, streaky, or uneven finish. "Think of hardware as kitchen jewelry - add new metal or glass knobs for an easy kitchen cabinet update," said Better Homes and Gardens. If you're using metal hardware, choose one finish for the scheme. Be sure to count the number of doorknobs, handles, or drawer pulls before heading out to stores, garage sales, or flea markets. And if the new hardware doesn't fit the old holes, simply buy some backplates to cover the gaps and then drill new holes. 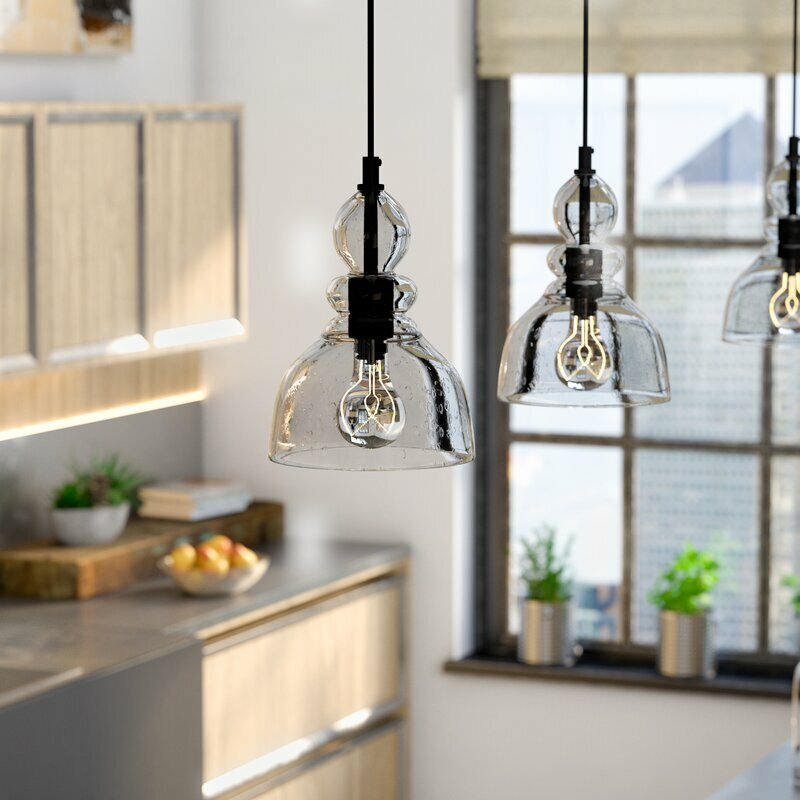 If you have an island or breakfast bar, consider hanging pendant lighting. A series of three pendants gives you sufficient lighting and is also in line with today's trends. Modern kitchens are a place for family to gather, and designating a space for young kids to have some fun is an easy way to foster that togetherness. "Chalkboard paint inexpensively turns a ho-hum kitchen into a hip family-friendly hangout," said HGTV. "Simply paint a wall or section of smooth cabinet doors, then tell your family they can write on the walls." We love the fact that chalkboard paint comes in all sorts of colors now, and you can also get whiteboard paint and magnetized paint. New cabinets are expensive! You can lighten up the look of your cabinets without changing them out completely by popping out the panels and replacing them with glass; this will give you a more updated look and also bring more light into the space. "Replacing existing doors with glass-paneled ones looks like a major upgrade," HGTV's Scott McGillivray told Good Housekeeping. "Opt for frosted glass, if you feel like your shelves aren't display-worthy." You’ve seen it all over TV. Open shelving is a kitchen trend, and it’s one you can easily create without much fuss by completely removing a cabinet or two from the walls. Or, you can create this unique look that’s even easier to accomplish. "Create the look of a built-in china cabinet by simply removing a set of cabinet doors and filling the space with shelves displaying your favorite dishes," said HGTV. "For added pop, line the back of the cabinet with wallpaper or paint it in a complementary color."